In the booklet accompanying David McVicar’s production of Le nozze di Figaro, recorded at the Royal Opera house in 2006, there’s an essay by the director in which he raises all kinds of questions about the rise of the bourgeoisie, the nature of revolution and romantic conceptions of love. He even appears to draw a parallel between Joseph II and Tony Blair. Then he declines to explain how he has embodied all these ideas on the stage and challenges us to “Watch, listen, participate”. Well I did and I’m none the wiser. What I see her is an essentially traditional approach; transferred cosmetically to 1830s France but so what? It’s darker than some Figaro’s but not nearly as dark as, say, Guth. Curiously, the main “extra” on the disks “Stage directions encoded in the music” tees this up much more clearly than the essay. Le miracle d’une voix is a compilation of scenes from various recordings in which Natalie Dessay featured made between 1993 and 2003. It’s especially interesting in that a couple of pieces feature more than once. There are three Les oiseaux dans les charmilles; Olymia’s aria from Les contes d’Hoffmann and two Grossmächtigen Prinzessin from Ariadne auf Naxos. Thrse demonstarte what I have always believed to be Dessay’s greatest strength; her ability to recreate a character to fit in a particular production. The two Zerbunetta arias illustrate this perfectly. In the first, a Salzburg production from 2001, Zerbinetta is a depressed, heavy drinking, prostitute who celebrates a kind of deeply sad sisterhood with Ariadne before being dragged off by a very sleazy Russell Braun. In the second, from the Palais Garnier in 2003, she’s a bubble headed tourist in bikini and wrap who pesters poor Ariadne all around what looks like a Mediterranean building site. They are completely different characterisations but both highly effective. The same is true of the three Olympias who range from very conventional doll to inmate in some sort of asylum or home. The 2003 Royal Opera House recording of Die Zauberflöte has a terrific cast and it has Sir Colin Davis conducting. The production is by David McVicar and it’s one of those that make one wonder how he ever got a “bad boy” reputation. It’s perfectly straightforward though rather dark (emotionally and physically) and has a vaguely 18th century vibe. In places it seems a bit minimalist, as if the director couldn’t really be bothered with things like the Trials. The interview material rather suggests that McVicar was a bit overawed by doing Mozart with the great Sir Colin and tried very hard to match his rather old fashioned theatrical sensibilities. 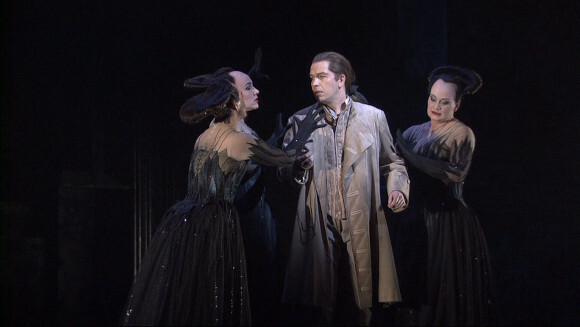 Claus Guth’s 2008 Salzburg production of Don Giovanni divided the critics along entirely predictable lines. It’s a very unusual treatment of Don Giovanni but the concept is stuck to with real consistency and it works to create a compelling piece of music theatre. The treatment on video too is not straightforward and, in a sense, the DVD/Blu-ray version is as much the work of Brian Large as it is of Claus Guth. 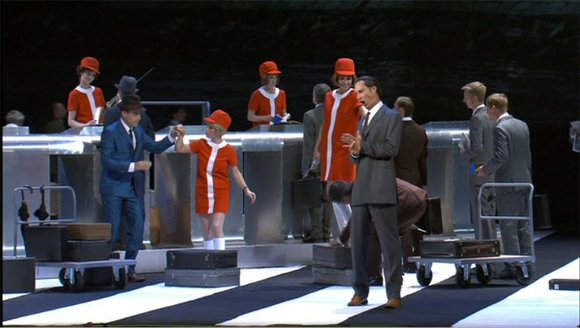 The problem with reviewing Doris Dörrie’s 2002 Berlin production of Così fan tutte is that pretty much everything that can be said about it already has been. It’s like trying to write about Willy Decker’s “red dress” Traviata. So I’ll try and be brief and to the point. On the surface the idea is a bit outlandish. Mozart and da Ponte’s satire about sexual fidelity is updated to the 1970s though to me, who grew up in the 70s, it seems much more like the 60s. That said, it works. It’s lively, funny, musically top notch and the presentation on DVD is very decent.